Choose from a Monday or Wednesday. Choice of session times (3.25pm-4.25pm and 4.25-5.25pm). Double Session 3.25-5.25pm available too. 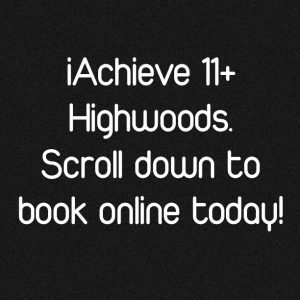 Welcome to Highwoods 11+ iAchieve Centre! The iAchieve 11+ Tuition Centre at Highwoods, Colchester is located within Brinkley Grove Primary School and is open to children from across Colchester. The centre is a 2 minute drive from a Tesco Superstore, ideal for parents wishing to drop and shop! We are able to offer the Highwoods iAchieve 11 + Programme on both a Term Time or Full Year basis. Click below to secure your child’s place, or add their name to the iAchieve Waiting List if your preferred session is sold out. If you wish to find a centre that operates on a different day of the week why not visit the iAchieve 11+ map (HERE) where you can click on each pin to see opening days? Fill in the form below to register for the Highwoods iAchieve 11+ Tuition Centre, Brinkley Grove 11+ Course (£30.00 registration fee).